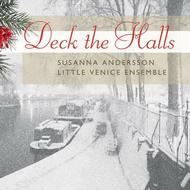 'Deck the halls' is a wonderful Christmas disc from London-based Little Venice Ensemble, together with Swedish star soprano Susanna Andersson. They have put together a kaleidoscope recital of classical, popular and folk songs, all wonderfully arranged for this brilliant classical group. Every piece on this personal, eclectic mix is performed with stylish grace and disarming sincerity, guaranteed to charm music lovers everywhere. This is a wonderful mix of classical Christmas music and carols from around the world as well as classical arrangements of much-loved popular Christmas tunes. An international group and a multi-national Christmas, 'Deck the Halls' is a very classy Christmas album!